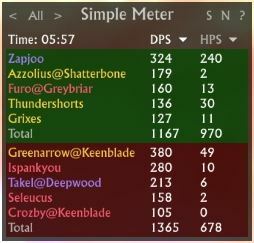 SimpleMeter is an easy-to-use DPS/HPS meter that shows damage and healing for both allies and enemies. Donations of plat to Jor @ Deepstrike welcome! It would be great if you could show the damage taken and a ration dps to damage taken to better show actually performance (i.e. : high dps and high damage taken is a bad dps, while high damage done with almost no damage taken is a very good dps). Ya i would love a resize option. I would also KILL for interrupt and cleanse meters. Is there anyway you could include interrupts on this meter? there could be an option on the meter to show or hide interrupts on the meter. This will help like no other on fights like Murdantix, as I am an officer in our raids. If you mean how to export the dps to chat, as far as I know it's not currently possible. any way to report the dps done?